The first in a series of releases GD Stereo is calling “Improvisational Architecture”, intended to showcase artists who challenge preconceptions about both music and architecture. GD Stereo believes, and one can only wholeheartedly concur, that the plastic arts convey as much “excitement” of aesthetic sensation as poetry or music. Look at Frank Gehry´s concert hall in LA; that´s architecture dancing, reciting poetry and singing about itself. 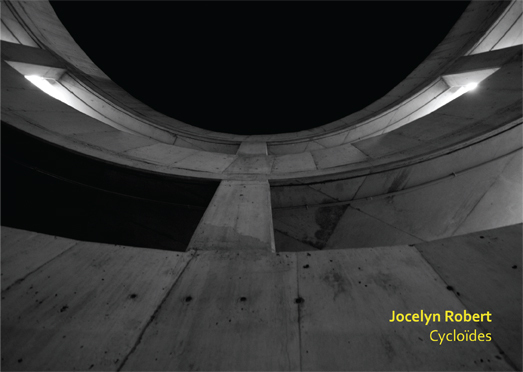 Trained architect Jocelyn Robert left the profession in 1989 to use the built environment as a great big instrument, a network of situations from which to draw inspiration and derivation. Cycloïdes is a neighbourhood, featuring town homes and mid-rises, busy traffic, coffee shops and retail spaces, pavilions and a playground for the kids. Seated at the disklavier, an acoustic piano with its own computer recording and saving the “data” fed into it in performance, Robert plays with joy, racing around the keyboard like a pinball or leaning in intently, seemingly watching each note levitate up and out. At the same time, the software is tracking his playing, flubs and all, “forcing” him to use them as the foundation for the ones that follow, whether Robert likes them or not, “reaffirming [the] instant past” of the piece, as he puts it. Thus the semi-cyclic nature of the seven unnamed situations he puts himself in. As such, it would seem Cycloïdes mimics nature more than engineering. Or that Robert has built a sentient house with neural pathways, some of which, as in all fallible beings, sometimes misfire at their connecting nodes. It makes for a very human milieu and a sustainable listening environment.